Good morning! 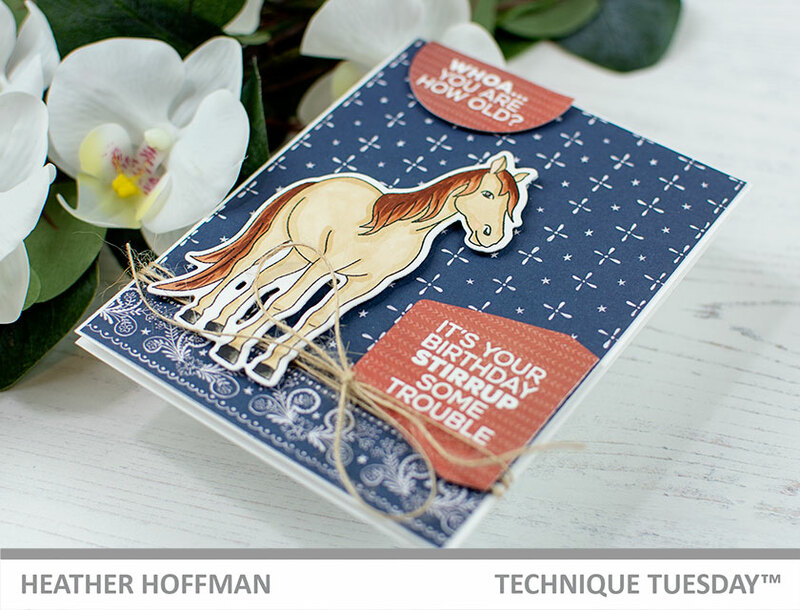 Welcome to Day 2 of sneak peeks for the July Release from Technique Tuesday! Woohoo!!! Lots of fun new stamps and dies in this release - make sure and check out the Technique Tuesday Blog to find links to all the Design Team's projects for today! For today's card I'm featuring the darling new Simon and Sandy Seahorse stamp set to create this underwater stamped background and scene! 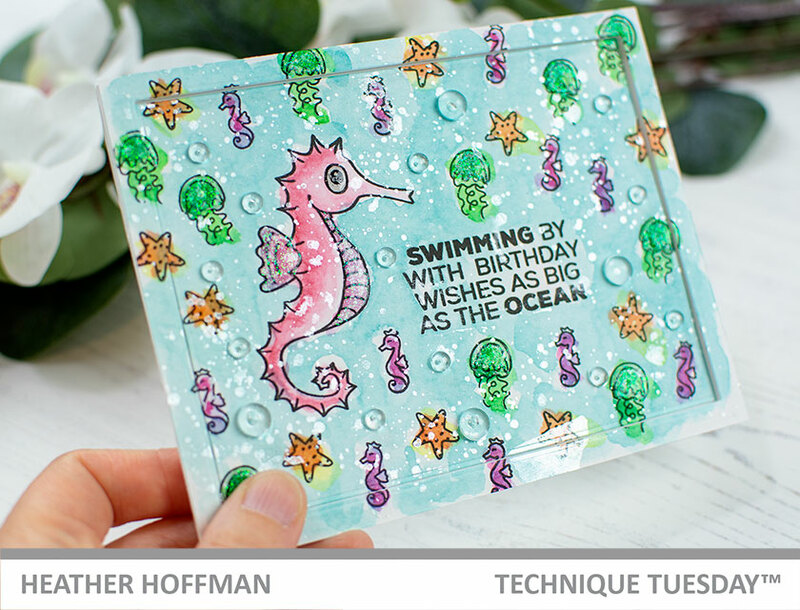 I also added Nuvo Glitter drops to jellyfish and parts of the seahorse, Crystal Glaze to the eye of the large seahorse, and lots of clear droplets from Pretty Pink Posh for bubbles. I almost made it into a shaker card, but in the end opted to just pop up the outside of the frame for a shadowbox effect. Good morning! 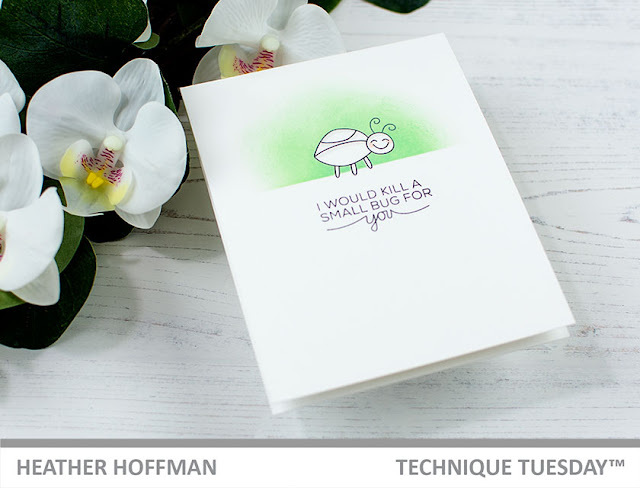 It's that time to start sharing sneak peek projects for the July Release from Technique Tuesday! Woohoo!!! Lots of fun new stamps and dies in this release - make sure and check out the Technique Tuesday Blog to find links to all the Design Team's projects for today! 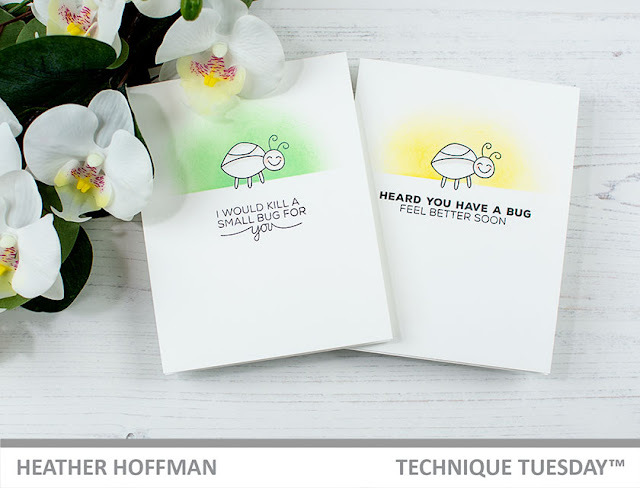 I'm kicking off my projects today for the release with these clean and simple little card featuring the adorable new Bugs and Kisses Stamp Set! 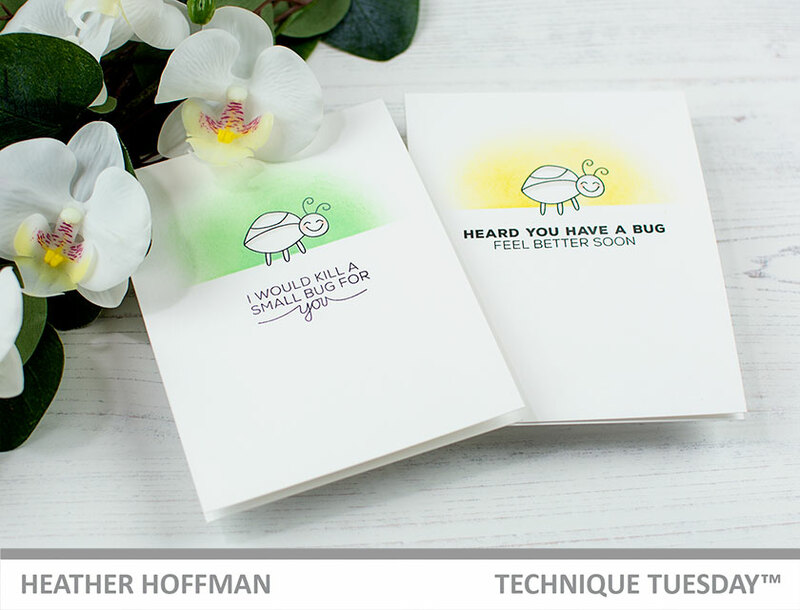 I made these cards completely one layer by stamping the bugs on white cardbases, masking off the image, adding distress oxide ink, and then adding the sentiments. 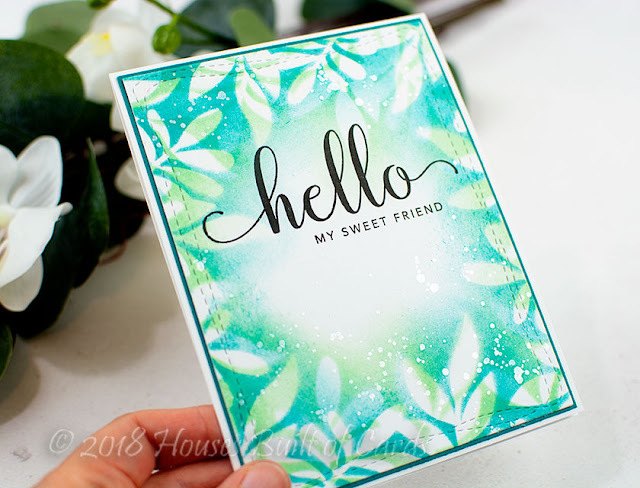 For this first card, I used Cracked Pistachio ink for the background - isn't this sentiment the most adorable thing ever?!?!? 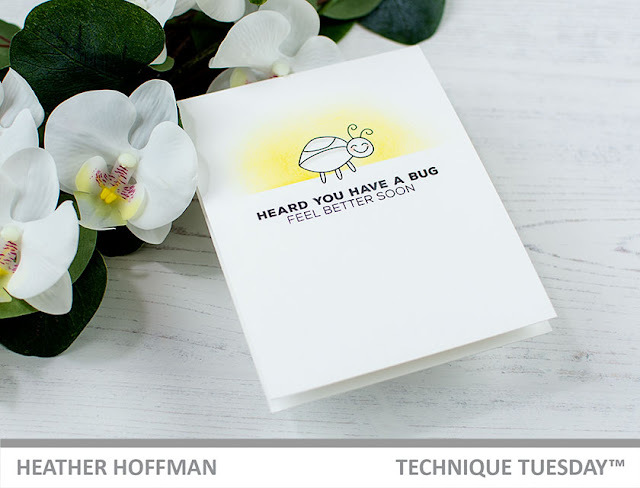 I was going to use a different bug from the set for my second card, but couldn't resist using this cutie again! Plus, it meant I could re-use the same mask, so that was kinda nice too! For this background I used Fossilized Amber oxide ink. I also added a touch of Copic marker to the bugs with a bit of pink on the cheeks and some soft gray for shadows on the bugs bodies. Good morning! Today I have a couple of cards to share using a beautiful stencil from Simon Says Stamp that I picked up from a previous release and hadn't had a chance to use yet - paired up with a fun sentiment set that had also seen very little ink! 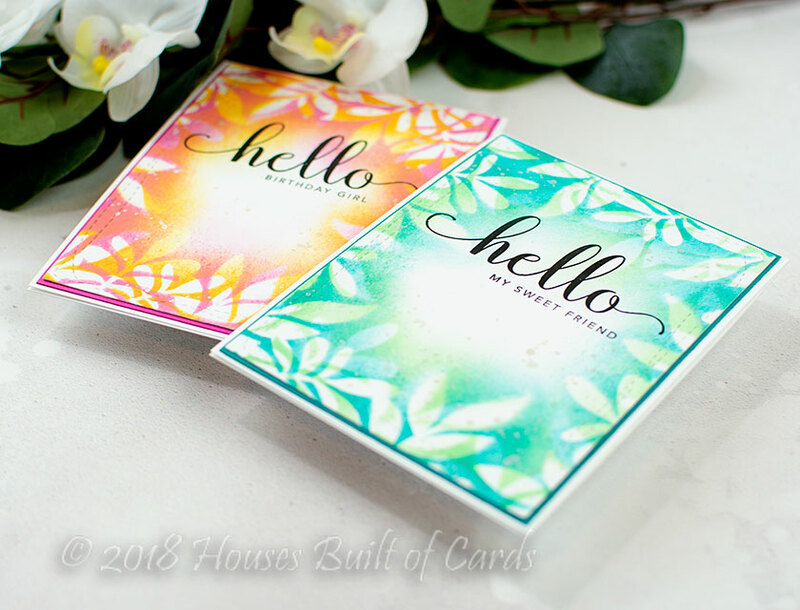 I used the Leafy Frame stencil in a bit of a different way - on each card I blended one color of distress oxide ink over the stencil, rotated it 90 degrees, then blended a different color over it. 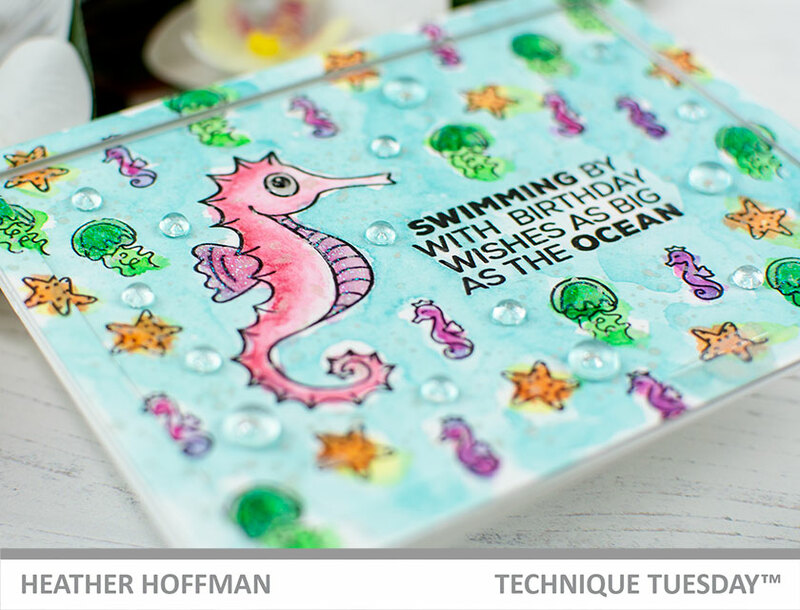 This gave a fun two layer effect - I love how it came out! 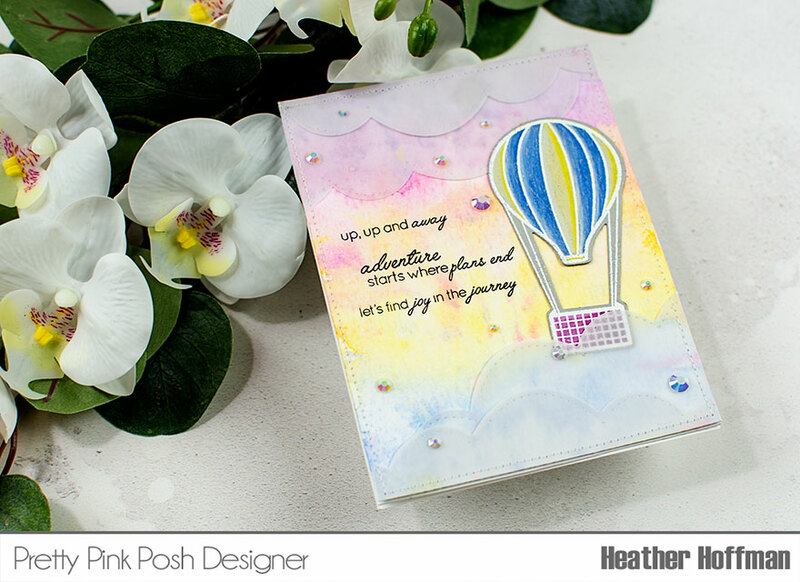 I also added some white gold splatter with my Starry Colors Palette - the next two photos show that sparkle the best. 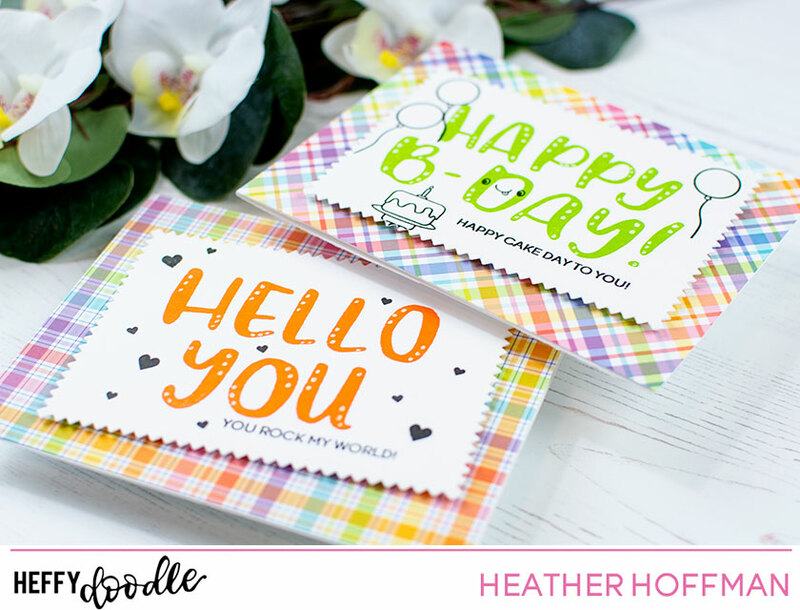 I die cut each panel with Wonky Rectangles dies, then added my sentiments from CZ Design's Hello You Stamp Set. I matted each one with some coordinating SSS Cardstock, and then mounted on a white cardbase! Good morning! I'm back to share more cards today using some goodies from the NEW Simon Says Stamp Good Vibes Release - paired up with a few older stamps and dies as well! 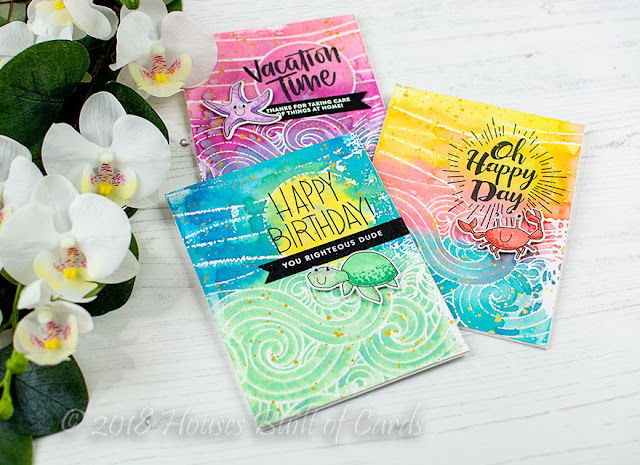 All of these cards feature the fabulous new background stamp from Simon Says Stamp called Beachy Waves - I hadn't had a chance to play with this stamp yet when I was preparing for the blog hop, and WOW! 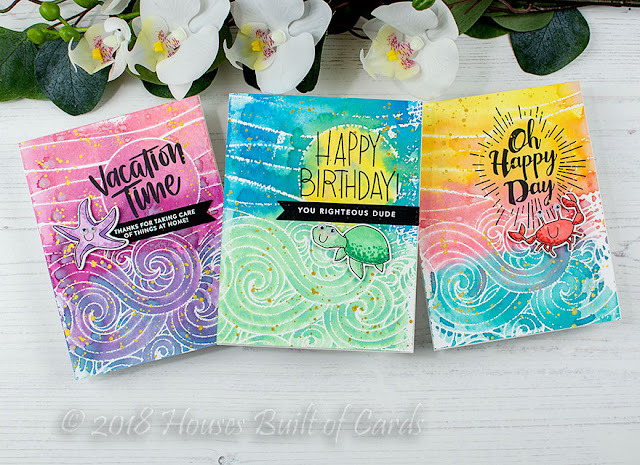 When I pulled it out to play I was hooked and ended up making these 3 cards - and I had to stop myself from creating more backgrounds with them! Sooo fun! 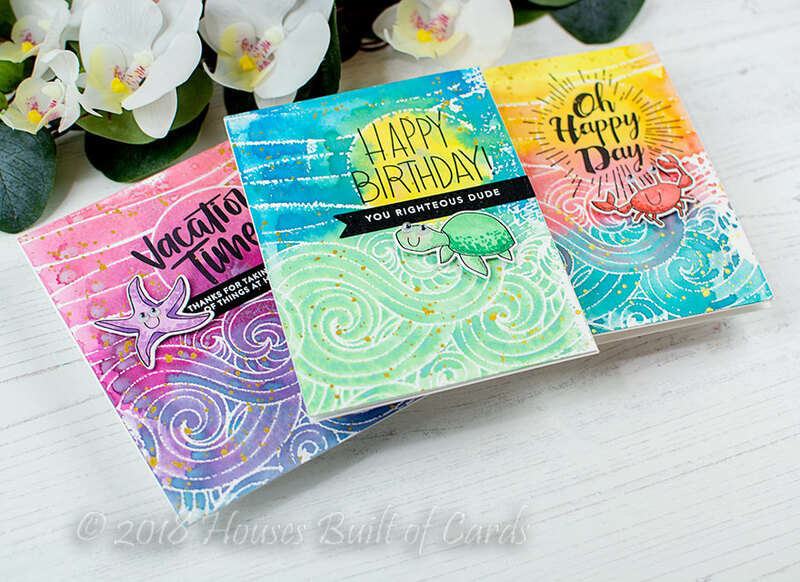 Basically for each background, I set the huge 6x6 stamp set down on my desk upside down, inked it up with several different colors of distress oxide ink, misted slightly, then pressed the smooth side of some Tim Holtz watercolor paper onto the top of it - when I pulled the paper up I was left with these amazing and magical backgrounds! 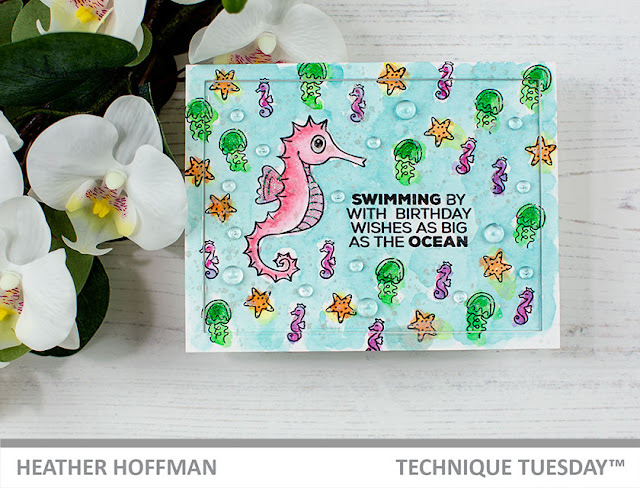 I then embellished with a mix of older and newer sentiments, and a few critters from Under the Sea (from a recent SSS release). First up, for this card I used fairly literal color interpretations for my background - Fossilized Amber, Salty Ocean, and Cracked Pistachio. 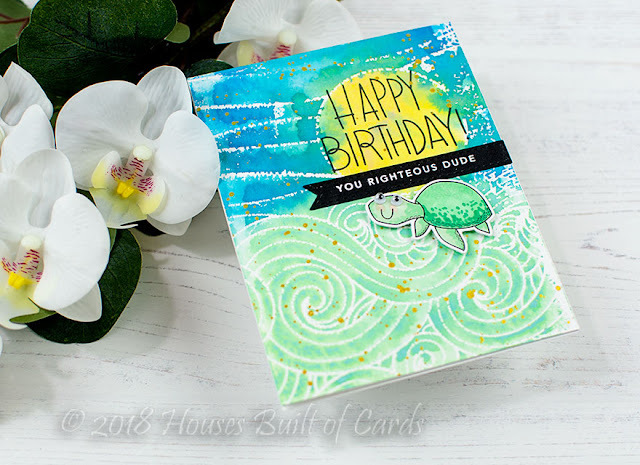 I added a sentiment from an older SSS card kit - It's No Secret, heat embossed a tiny sentiment from a CZ Design stamp set called Hello You on a strip die cut with SSS Stitched Banners Dies, and then added the cute turtle from Under the Sea. Does this make you think of the turtles from Finding Nemo?!?!? Haha! For this next one I went with a bright and summery - kind of tropical - color combination! I used Fossilized Amber, Spiced Marmalade, Picked Rasberry, and Peacock Feathers. 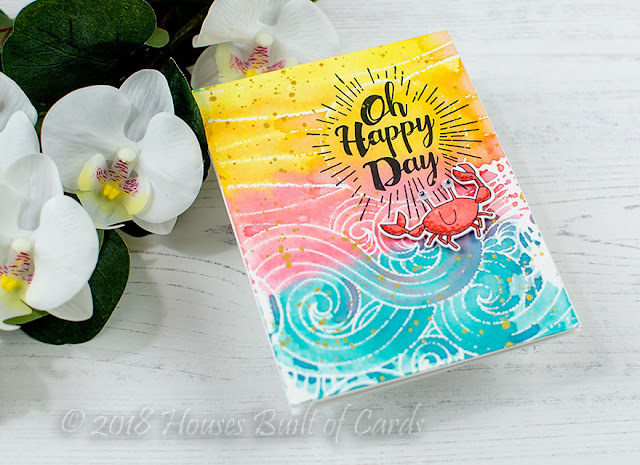 I added a sentiment from and older SSS stamp set called Oh Happy Day, and the cute crab from Under the Sea. Finally, this color combo - Worn Lipstick, Seedless Preserves, and Broken China! 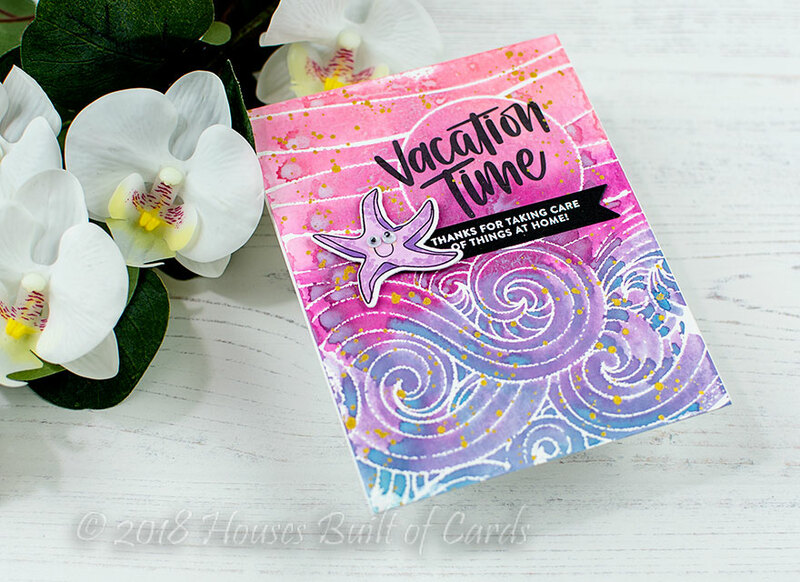 This one I added a sentiment from another Good Vibes Release - Vacation Time. 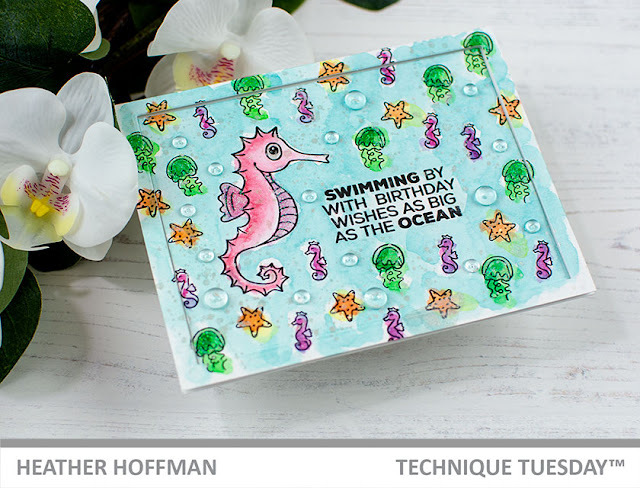 That little starfish is, again, from Under the Sea, and I added another sentiment from the same stamp set heat embossed on a little banner die cut with SSS Basic Banner Dies. I finished off by adding some gold splatters with my Starry Colors Palette. 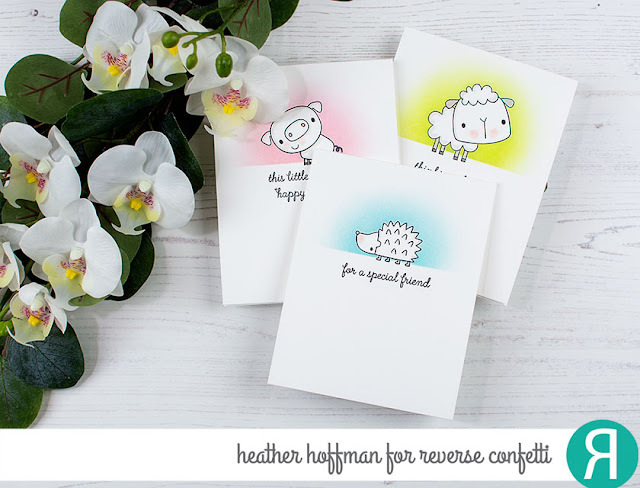 I also added tiny wiggly eyes on each of the cute critters - because wiggly eyes are ALWAYS cute, right? If you didn't grab this stamp from the release - you may want to go nab it now! This one is seriously fun - and perfect for summer! Which color combo is your favorite?!?!? Thanks for stopping by - have a great day!!! Good morning! 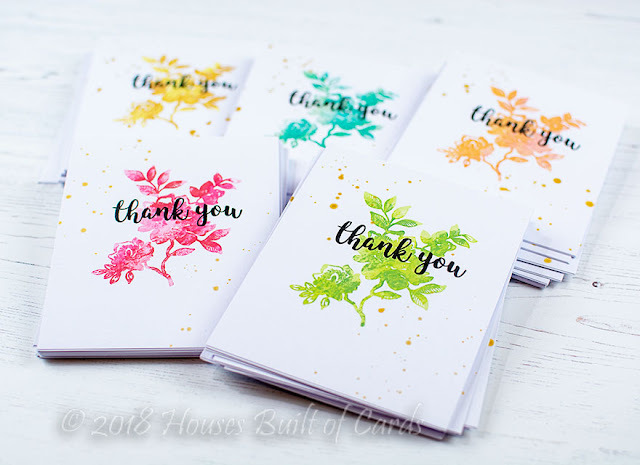 A couple months ago I had a custom request for 50 thank you cards from a friend. 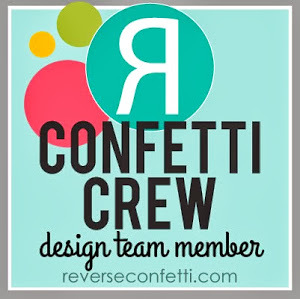 She had seen the cards I made for a Reverse Confetti Wednesday in the Works post (you can see it HERE) and like them - so since I was doing 50 of them, I was able to simplify them a tiny bit to make them easier to put together. I was actually AMAZED by how quickly these came together! I think it took around 2 hours - and that included cutting and scoring the cardbases even! I didn't do it in a straight 2 hours - it was a bit intermittent, but they really did come together quickly! 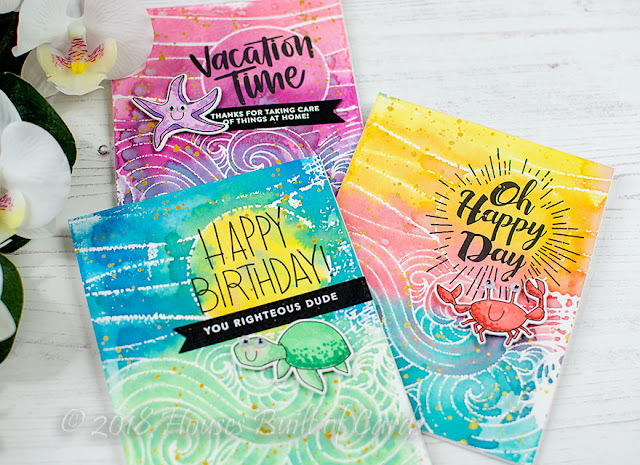 If you go watch the video, you'll see how these came together using Reverse Confetti's Something Wonderful Stamp Set, Kindness Cards Stamp Set, my MISTI, 3 different colors of Reverse Confetti dye ink for each color, and some plastic wrap and my finger to marble the colors! 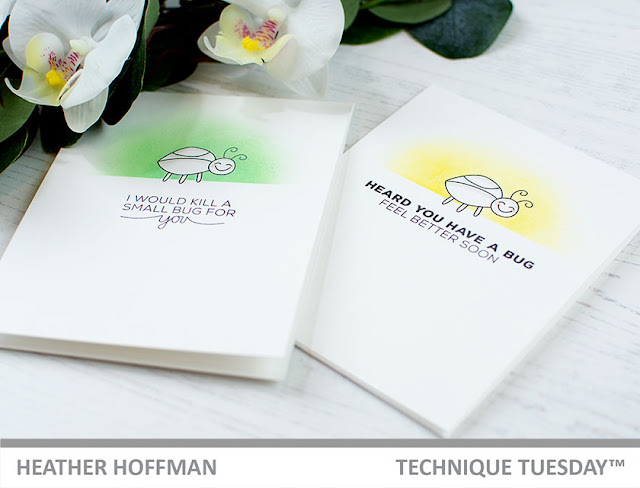 For that video I had only done 3 color combos, and added a frame around the card. This time I skipped the frame (because, hello? 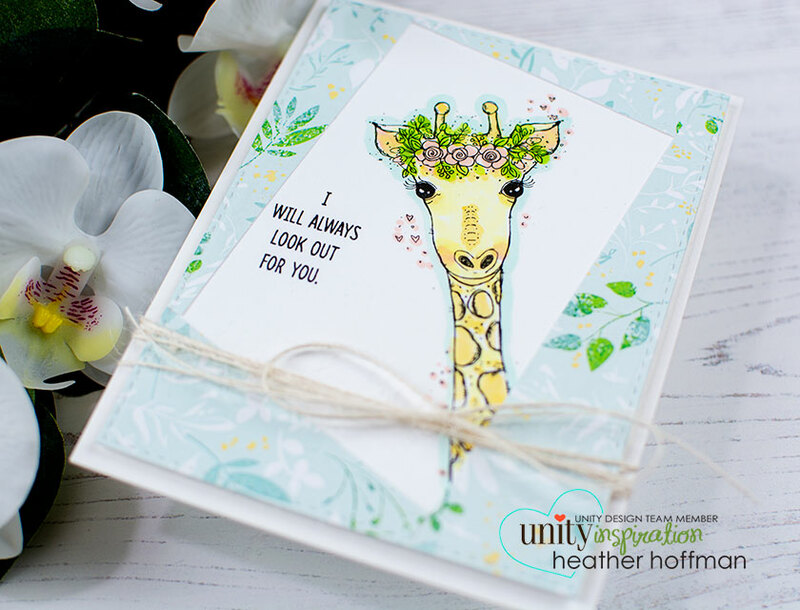 die cutting 50 times? no thank you!). I added two color combos, so I ended up with 10 each of 5 different color variations. All the colors are linked below as well, but for the yellow I used Buttercup, Sunshine, and Rust; for the blue I used Seafoam, Mint, and RC Aqua; for the orange I used Peach, Coral, and Tangerine; red used Piggy Bank, Flamingo, and Salsa, and green was Pistachio, Lime Green, and Avocado. As a final finishing touch, I added some gold splatters to each one using my Starry Colors Palette - my favorite way to add gold splatter! I did 10 at a time, and laid them all out on my desk to dry before moving on to the next ones. It was the perfect finishing touch - I was a little scared to ruin them when I started, but was so glad I decided to go for it! Good morning! 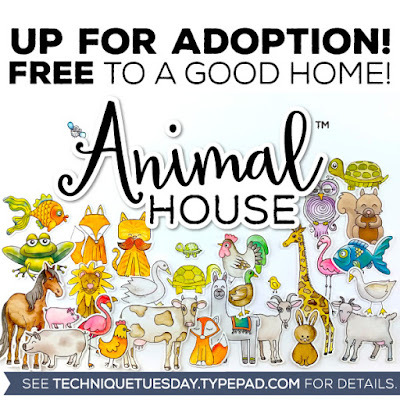 This morning, Technique Tuesday has a special giveaway! Pop over to the Animal House Category at Technique Tuesday and choose your favorite animal stamp set, then pop over to the Technique Tuesday Blog and leave a comment with that name for a chance to win it! 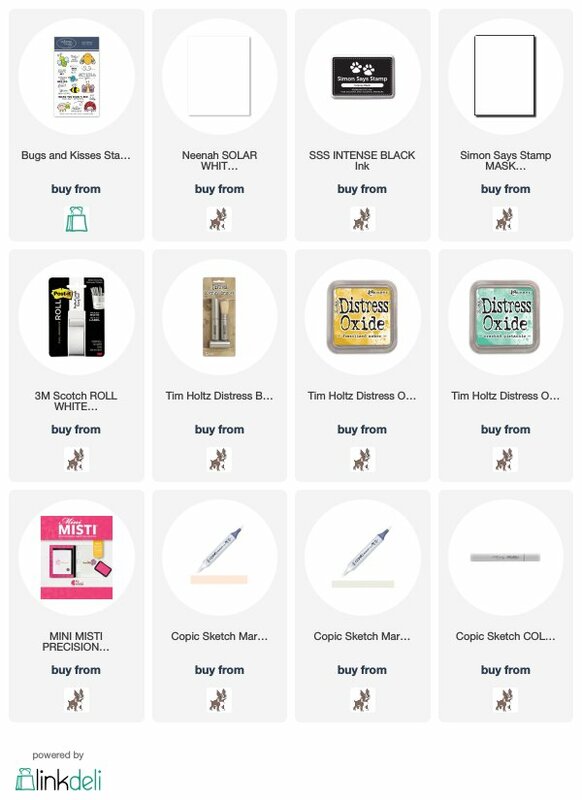 Comments must be left by June 29th - winner will be announced July 1st! These sets are always the cutest little critters - and the sentiments are so perfectly punny! LOVE! 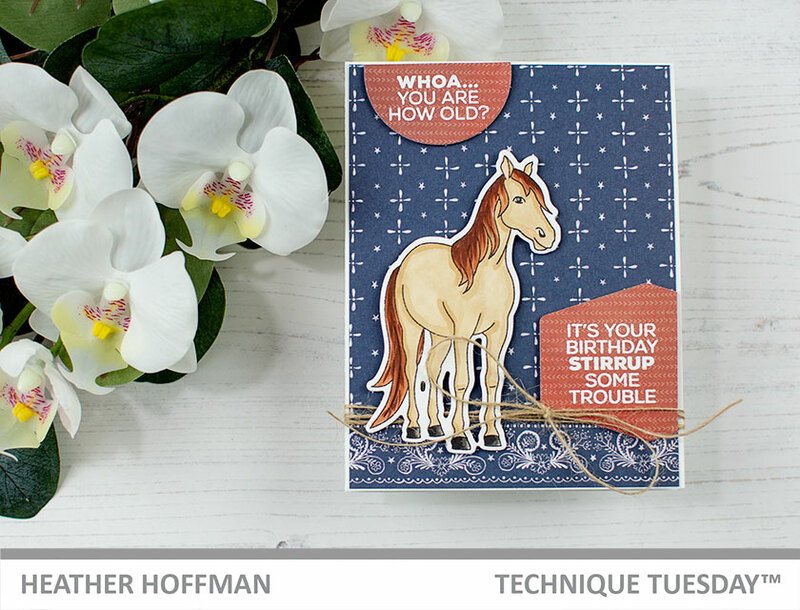 To help give you some ideas - I have a card using one of the recently released Animal House Sets - Hanna the Horse! 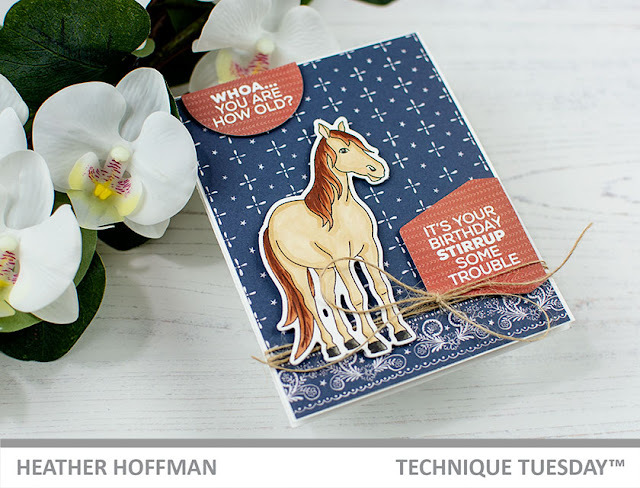 I love this super cute horse image - I was definitely a horse crazy girl growing up, and still love them. My girls now take riding lessons and love them as well! 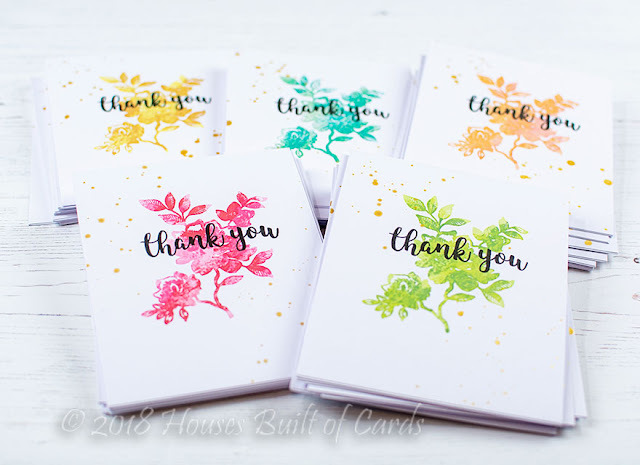 And as always - the sentiments in this set are PERFECTION! 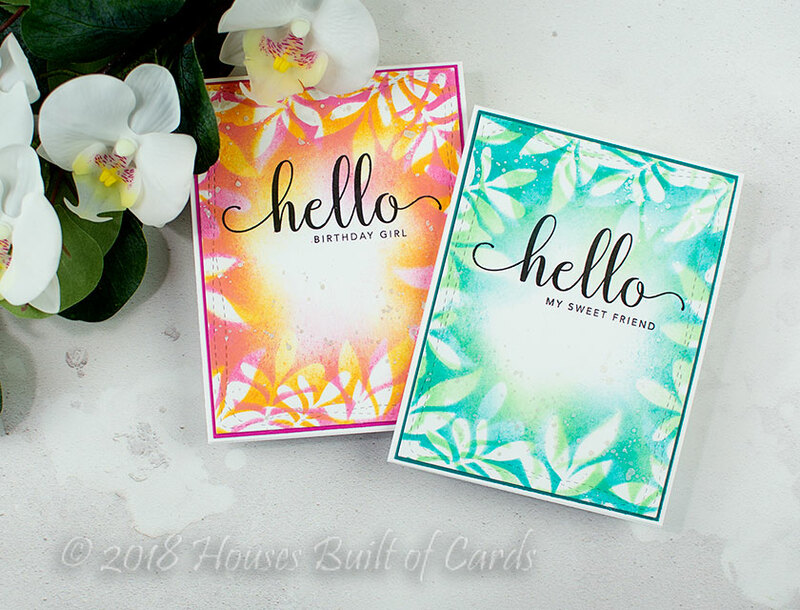 I used two of them for this card, heat embossed on some pattern paper and then die cut using Hexagon Steel Dies. The horse is colored with Copics and die cut with the coordinating Hanna the Horse Dies. 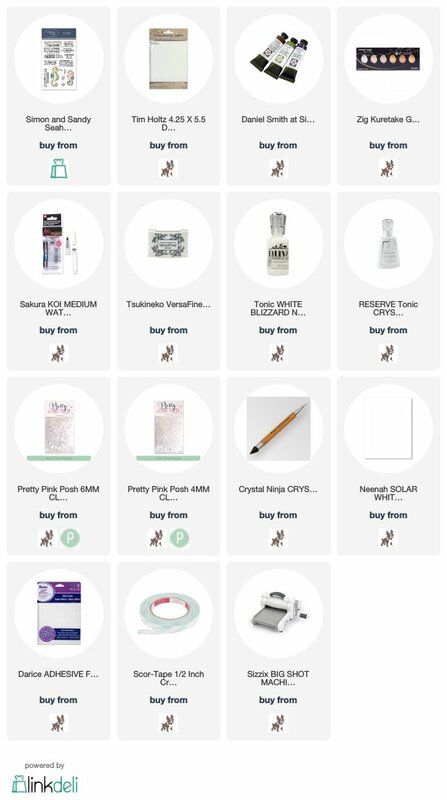 And isn't that pattern paper perfect? 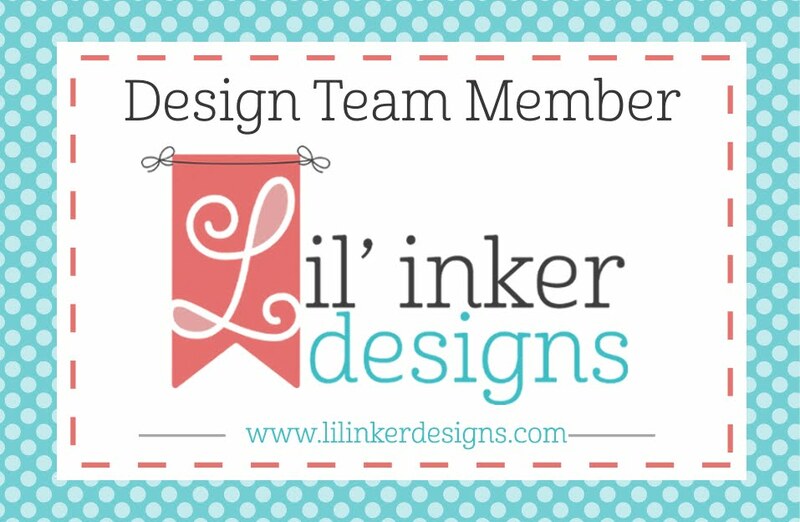 It's from an older 6x6 paper pad called Creekside - one of my favorites. Good morning! 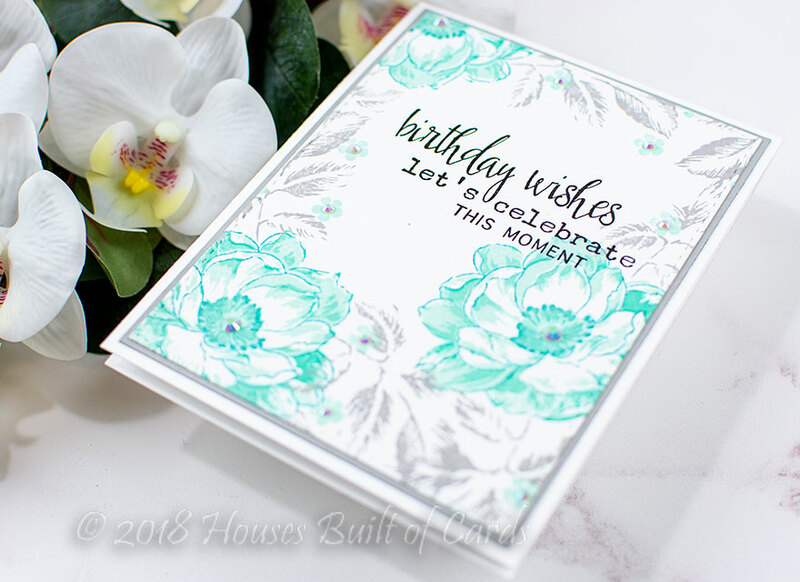 My daughter recently turned 15, and as always, I try to set some time aside to make a very special just-for-them birthday card on their special day! 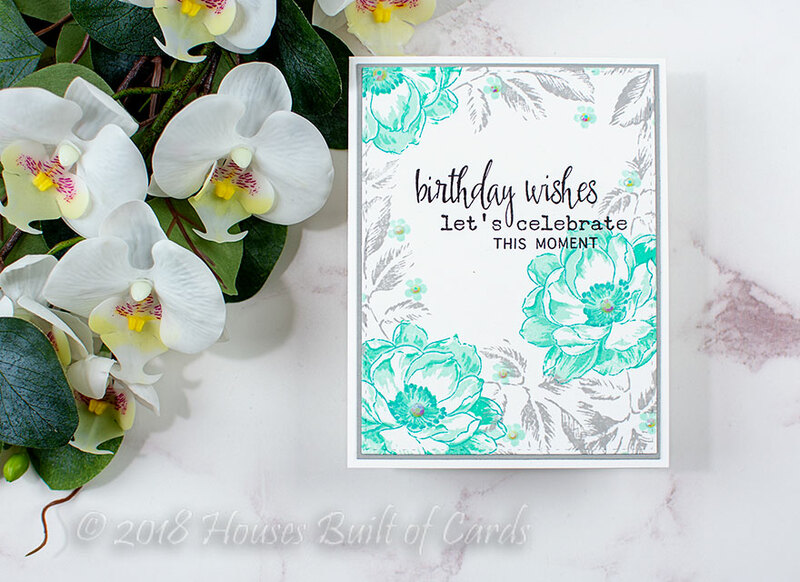 I chose this card to reflect some of her favorite colors, and also the fact that she is getting so very grown up - that's why this is a more grown up card than I think I've done so far! I pulled out several of my Altenew stamp sets to build this card! 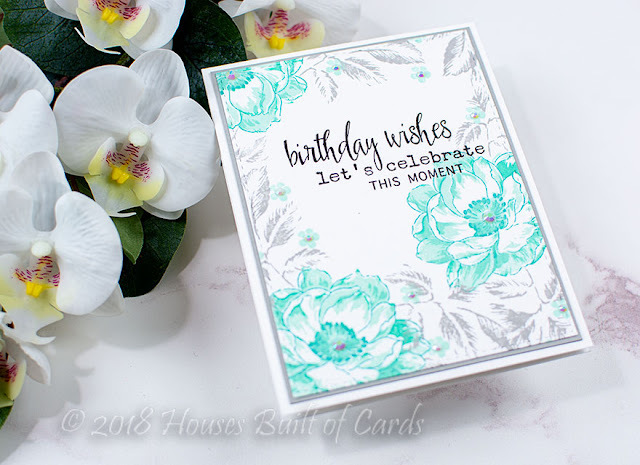 I started off with the Beautiful Day Clear Stamp Set, and stamped the flowers using just 3 of the layers - skipping the base layer. I used Mountain Mist, Volcano Lake, and Lagoon Crisp Dye inks to stamp the flowers. I can never get over the amazing layering of Altenew floral images - the realism is astounding and breathtaking! 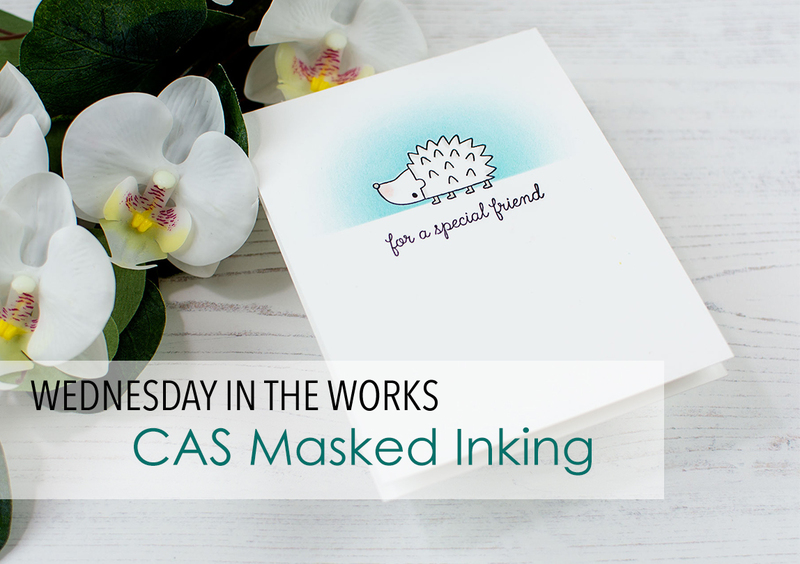 I stamped just one layer of the leaves from this set to fill in the background using Silver Stone ink. 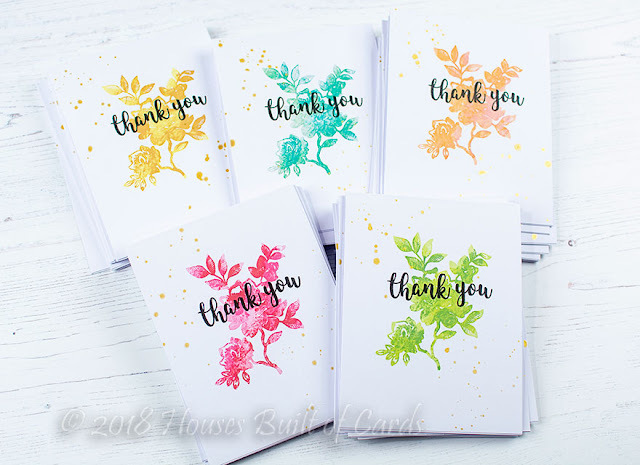 It felt like it need a few additional pops of color, so I filled in some tiny flowers from Vintage Roses using Mountain Mist ink, then I pulled out some Pretty Pink Posh Pearl White Jewels to add to the centers of all the flowers - it was the perfect touch of elegant sparkle! Finished off by adding the sentiment that was built with Birthday Greetings and Floral Shadow, die cut the panel with a stitched rectangle, matted with some gray cardstock, and mounted on a white cardbase. Good morning! Just dropping by to share a peek of a couple cards I have on the Heffy Doodle Blog this morning! 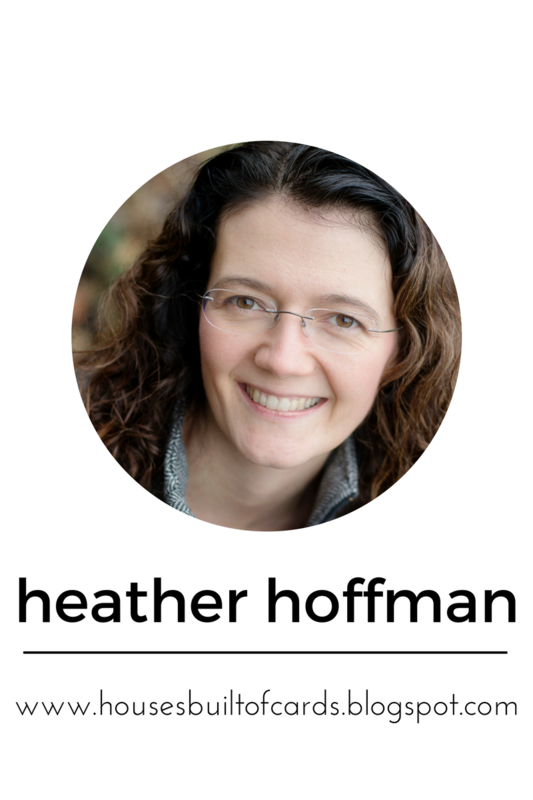 You can check out the post HERE to see more! Good morning! 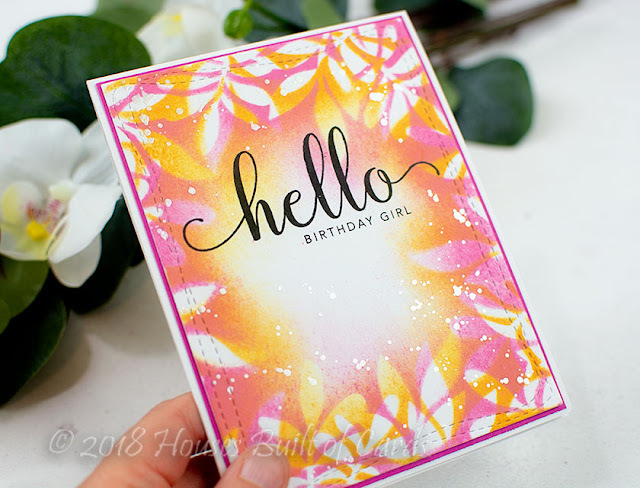 Today I have a tutorial for this card on the Pretty Pink Posh Blog - AND - this set is on sale for the next 4 days as well! Woohoo! You can check out the blog post HERE, and find this set in the shop HERE (and dies HERE)! 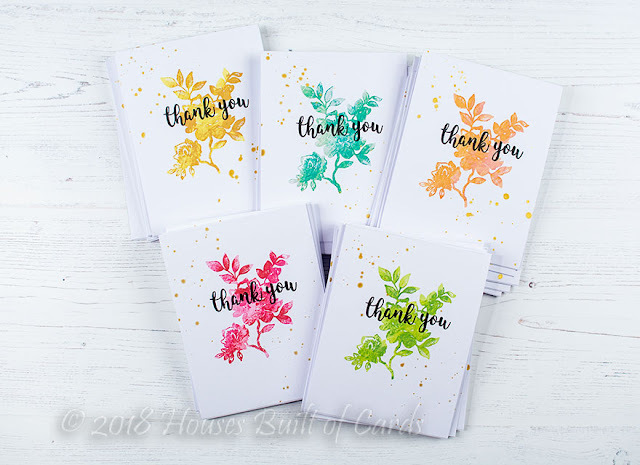 Thanks for stopping by - have a wonderful day!! !